Tail-anchored membrane proteins, which include a number of essential genes such as SNAREs, contain a single transmembrane domain at their C-terminus requiring post-translational targeting and delivery. Starting in 2007, the specialized ‘GET’ targeting pathway was identified in yeast and includes Get1-5 and Sgt2. My group has worked on all aspects of the pathway structurally characterizing the proteins involved in the targeting and delivery to the ER in both yeast and the more complicated human pathway (Figure below). So far, these efforts have resulted in over a dozen unique NMR and X-ray crystal structures. 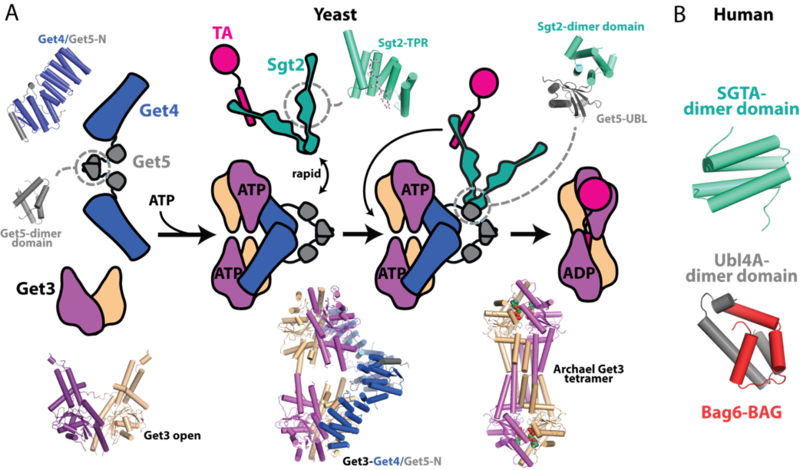 ​Christian Suloway, Justin Chartron, Ma’ayan Zaslaver & William Clemons, Jr. “Model for eukaryotic tail-anchored protein binding based on the structure of Get3.” Proceedings of the National Academy of Sciences (2009) v106 n35 pp14849-54. Justin Chartron, David Vandervelde, William Clemons, Jr. “Structures of the Sgt2/SGTA dimerization domain with the Get5/UBL4A UBL domain reveal an interaction that forms a conserved dynamic interface.” Cell Reports (2012) v2 n6 pp1620-32. Harry Gristick, Meera Rao, Justin Chartron, Michael Rome, Shu-ou Shan & William Clemons, Jr. “The structure of a tail-anchor membrane protein-binding complex reveals the regulation of Get3 by Get4.” (2014) Nature Structure & Molecular Biology v21 n5 pp437-42. ​Jee-Young Mock, Justin Chartron, Ma’ayan Zaslaver, Yue Xu, Yihong Ye & William Clemons, Jr. “The Bag6 complex contains a minimal tail-anchor targeting module and a 'mock' BAG domain” (2015) Proceedings of the National Academy of Sciences, USA v112 n1 pp106-11. ​​Integral membrane proteins (IMPs) are of both fundamental scientific and medical importance, because they govern the flow of nutrients and information across cell membranes and because they comprise the largest class of therapeutic drug targets. However, the structural and biophysical characterization of IMPs lags far behind that of other protein classes, due to the inability to reliably produce significant quantities of IMPs for experimental studies. No framework currently exists for understanding the connection between the amino-acid and nucleotide sequence of an IMP and its expression level. No successful strategies exist for the general prediction and improvement IMP expression levels. We are working to remove these fundamental gaps in knowledge and technology via the combination of experimental methods to characterize IMP expression levels, rigorous data-driven strategies to disentangle the role of diverse IMP sequence properties on expression, and, in collaboration with Tom Miller's group, coarse-grained molecular dynamics methods to enable the simulation of key mechanistic steps that act as bottlenecks to IMP expression. Shyam M. Saladi, Nauman Javed, Axel Müller, William M. Clemons, Jr., “Decoding sequence-level information to predict membrane protein expression” bioRxiv (pre-print). A focus of my group has been an interest in chemical reactions that involve glycans at the membrane. This specifically involves two different bacterial systems including peptidoglycan biosynthesis and N-linked glycosylation. For the former, we have currently published studies on a phage lysis protein that inhibits the central membrane protein MraY demonstrating the sequence requirements. We additionally, in collaboration with the lab of Michio Kurosu have begun working towards the development of novel inhibitors. For the latter, we have worked on the human pathogen Campylobacter jejuni providing the first ultrastructure information and characterizing the proteome of the outer membrane vesicles. On both sides, we continue to work towards a deeper understanding with the hopes of developing novel antibiotics. Shiho Tanaka & William M. Clemons Jr., “Minimal requirements for inhibition of MraY by lysis protein E from bacteriophage phiX174” (2012) Molecular Microbiology 85(5), 975-985. Kyoung-Soon Jang, Michael Sweredoski, Robert Graham, Sonja Hess & William Clemons, Jr. “Comprehensive proteomic profiling of outer membrane vesicles from Campylobacter jejuni.” Journal of Proteomics (2014) v96 pp90-8. Axel Müller, Morgan Beeby, Alasdair McDowall, Janet Chow, Grant Jensen & William Clemons, Jr. (2014) “Ultrastructure and complex polar architecture of the human pathogen Campylobacter jejuni.” Microbiology Open (2014) v3 n5 pp702-10.